An outstanding variegated Japanese Maple, ‘Shirazz’ has foliage that is sure to attract many gardeners. 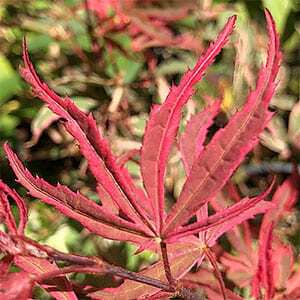 The new foliage as it emerges in spring is a crimson red with a hint of green to purple in the centre. As the foliage matures the foliage turns to green and creamy white with red. As summer ends the foliage then turns to a brilliant scarlet red. Perhaps one of the best red Japanese Maples available. This is maple with a moderate growth rate, it will reach to around 5 metres in height over time with similar spread. A natural vase shape, tall but still small enough to use in many smaller gardens. It is best to avoid hot sunny positions in warmer climates, dry soils are also best avoided. Choose a position with some protection from the heat of the afternoon sun, in warmer areas. Weed the soil, dig it over well adding well rotted compost and cow manure. Make sure the soil is well drained, hilling up f needed. The area prepare should be 3 times the diameter of the container, we suggest preparing a 2/3 to 1 metre circle. Plant Acer palmatum ‘Shirazz’ at the same depth it was in the container. Mulch around the plant with sugar can mulch or similar to maintain a cool moist root run and help suppress weeds. Fertilise using a slow release general purpose fertiliser in late winter. Extra aged cow or poultry manure can also be added each year before renewing the mulch. This type of maple requires little pruning. Remove dead or damaged wood as required.